I don’t have many strong feelings regarding Tokyo Ghoul. I started watching it in October, but only recently finished it despite it being only 12 episodes. Chalk that up to there being a lot of other good shows I was watching and me not being invested in Tokyo Ghoul’s story. It’s rushed and does little to distinguish itself from other recent cannibal monster anime like Attack on Titan and Parasyte. I’ll probably check out the second season if only to see how they follow up the non-ending of season 1, but my expectations are low. So why am I talking about a show I mostly have middling feelings toward? Because of this guy. Shuu Tsukiyama is the first major villain in Tokyo Ghoul. His primary motivation is to eat Ken Kaneki, the main character, because he smells good. He’s more of a monster-of-the-week who does little to further the plot, but I couldn’t get him out of my head. Because I absolutely hate this character and everything he represents. His characterization harkens back to the gay-coding of Classic Hollywood. Characters couldn’t be explicitly homosexual under the Hays Code, so filmmakers had to be creative and find ways to imply a character was homosexual. However, this was problematic because these implied-to-be-gay characters were depicted as villainously perverse or inferior because of their homosexual and effeminate behavior. These films created and encouraged negative gay stereotypes despite never once explicitly talking about homosexuality. It may be 2014, but these stereotypes persist, even outside of the Hollywood system. In the short amount of time he matters, Shuu exemplifies these old gay stereotypes to an uncomfortable level. He takes an uncomfortable interest with Kaneki the moment he meets him, prompting Touka to call him gross. In another scene, he snorts a handkerchief with Kaneki’s blood on it. 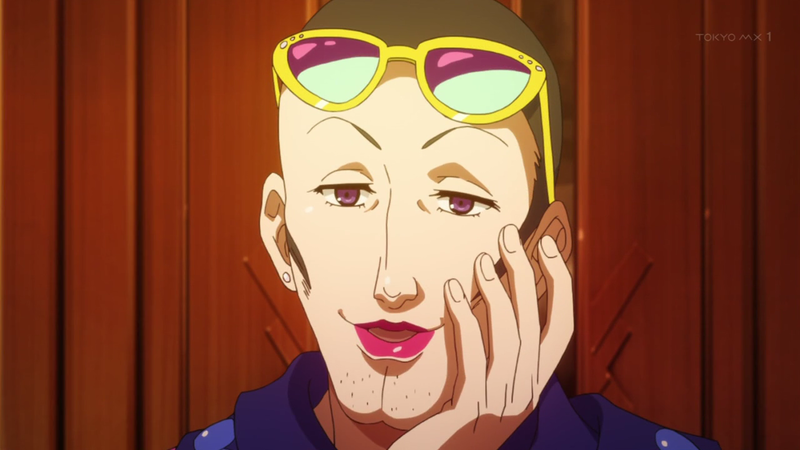 Tokyo Ghoul goes out of its way to portray this as creepy villainous behavior, as if to say “this guy has the hots for another guy and that’s totally fucked up!” As a bisexual man, I can’t help but be appalled that this character was ever allowed to exist. Tokyo Ghoul, with its story about lost souls trying to live in a world that hates and fears them, could have been a great showcase for gay characters. The metaphor of fear and acceptance is right there, yet Tokyo Ghoul unironically and uncritically falls back on gay stereotypes to characterize a major villain. It’s a huge disappointment. Well, at least he’s the only horrible gay stereotype in this show, right? Next post: something more positive. This entry was tagged 12 days of anime, homophobia, homosexuality, tokyo ghoul. Bookmark the permalink. Unfortunately all you’ve seen of Tokyo Ghoul is the cartoon. I agree with everything you have said about the cartoon, but I can assure you the books are far different. In the books, Shuu is the most developed character. At first he is like this, yes, but he soon gains Kaneki’s trust, and his affections for Kaneki are shown in a better light. At one point in the book, Kaneki is believed to be dead. Because of this, Shuu goes into a clinical depression for 2 whole years. In the sequel (Tokyo Ghoul:re), when he finds out Kaneki is alive, he recovers, and is very humbled. He is no longer crazy and eccentric, he tries to make up for wrongs he had done before his depression, and he even admits to himself that Kaneki is not “food”, but someone he truly cares about. He is even a main protagonist in :re. Also, something that you might like to hear, there are other queer people in the sequel, and even queer poc and genderqueer people that are protagonists. One of the main characters, Mutsuki Tooru, is a transgender man of color. Kanae von Rosewald is Tsukiyama’s main servant, and a genderqueer character. If you found the story at all interesting, definitely read the manga! The storytelling is done with much more tact and detailed emotions. You won’t be disappointed. For me, the manga was a lot more disappointing, and there was way more queer coding. Heck, it’s implied that the trans masculine character you’re talking about is only trans because of trauma.